To us, peas run a very close second to corn for greatest vegetable. We freeze them on picking, so early varieties (usually lower-yielding and not always as tasty) are unnecessary. Given sufficient exposure to the literature, the choice in maincrop (podded) peas—when flavor is the chief determinant—seems to come down to Lincoln (one expert’s description: “great old-timey flavor”) and Green Arrow (same person: ”good flavor”). From our own experience, Green Arrow is really good, but Lincoln is the pea; still, most years we grow one bed of each type (“one bed” is 64 square feet with peas planted at 3"—we grow a lot of peas). Both those fine varieties are older types with, one gathers, little disease resistance; indeed, not a few seem to feel that peas immune to pea-enation disease are generally inferior in flavor to the older kinds such as Lincoln. (Note: the Lincoln is also known as the Homesteader.) Moreover, Lincolns tolerate warmth much better than most peas, so a warm spring or early summer is not fatal. We had some Alderman seed (“high flavor when cooked”), said to be the best of the vining sorts, but just never got time to establish a growing area for those, which—being climbers (also known as Tall Telephone peas)—need netting or some such to climb; some year, we’ll try to be more diligent. One can never have too many peas! (There is a definite distinction between “snap”, or edible-podded, peas (Pisum sativum var. saccharatum) and “sugar peas”, also called “snow peas” (Pisum sativum var. macrocarpon), which latter is not what we are referring to here—we don’t grow snow peas, but their culture is essentially the same as that for other peas. Snap peas are a cross between ordinary peas and snow peas. One of us likes edible-podded peas a lot, while the other keeps thinking “Wow, I coulda had real peas”. We have grown some edible-podded peas and were reasonably successful (though the bush/low-vine types are not heavy-yielding); but this remains, around here, one of those topics like how warm or cold the bedroom should be. Snap peas come in two distinct types (just as do classic peas): tall and short. The former need trellising or similar support, while the latter do not. Expert consensus is that the tall types taste nontrivially better, but to many the tradeoff in nuisance for trellising may not be worth it. Now peas are typically 9 to 10 weeks from sowing to maturity. Around here, we start to go over 70° on average around mid-May; that thus implies sowing peas around March 1st. Now cold-hardy or no, and snow-breaking or no, that does seem awfully early; one doubts that the soil temperature on March 1st will normally be the 40° bare minimum needed for pea germination (with 45° or even 50° often recommended as a sowing minimum). But if we tack on, say, a month, and sow April 1st, the growing period runs to mid-June, when we are averaging daytime highs here in the high 70s. But on the third hand, as the Martian said, a Maine-based seedsman remarks (of the Lincoln cultivar, said to be somewhat heat-resistant), “They yield [here] throughout July…” And on that Martian fourth hand, one apparently expert source said we want them done before temperatures hit 80° or so, which usually happens out here around mid-June. What with this and that, and relying primarily on the somewhat heat-tolerant Lincoln type, we feel that a sowing date of April 1st is satisfactory. Though it is perhaps not as critical as with some other vegetable families, it is still wise to rotate legume plantings so as to avoid growing legumes of any kind on the same soil two years running. Note, though, that peas—like all legumes—actually enrich the soil they’re grown in by “fixing” nitrogen intoi the soil at their roots; so, in a bed-rotation plan, peas (and beans) should be foillowed by some heavy-feeding crop, such as corn. 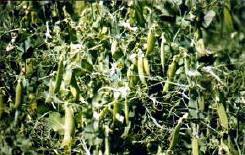 Peas want well-drained soil with the typical legumish pH of, preferably, 6.8 or even above. The soil does not need, or even want, to be particularly rich in nitrogen, because, as noted above, the peas will nitrogen-enrich it themselves. They do, however, want strong potassium and potash (phosphorus) content in their soil. Some gardeners soak pea seed, or nick it, it the belief that doing so will promote better germination. Most expert sources seem to feel that such practices not only don’t help, but hurt. As we said for beans, whether to apply inoculant (which helps the peas get started on their nitrogen cycle) seems a no-brainer: it’s cheap, and can only help. What we do is put a little inoculant powder in a fairly wide, shallow dish or holder, moisten it lightly, then roll each pea in it as we go to plant. Please note the two crucial adjectives there: a little and lightly: you’d be surprised how very little powder it takes to do even hundreds of peas; and you don’t want a soup, just enough light mudding that the stuff will readily adhere to the peas. Water lightly right after sowing. And, again, remember that birds love pea seeds and small green plants, and take appropriate measures. Because pea seeds are large, and can soak up and hold a lot of water, let the soil dry down pretty well between waterings till the pea seedlings have emerged and shown some vigor, else the over-damp soil can encourage seed rot. Peas are mostly trouble-free. Just water them faithfully once they’re well up, and wait for them to come ripe. (Try to avoid wetting the plant leaves; soaker hoses might be a good idea.) Weed if you must when the seedlings are first emerging, but not thereafter: weeding established pea patches will likely do more harm than good, because peas have numerous surface roots. Leave the row-cover material on as long as it isn’t interfering with pea-plant growth. If you can find a way to brace or frame it up off the plants (we have trouble doing that because of the occasional high winds here), it can stay on for weeks, till it starts to get really warm under the cover. Better, when in doubt, to be a bit early than a bit late. When the pods start to mature, pick daily—and be sure to look closely for ripe pods. If you’re growing your peas in a deep or raised bed, with block (as opposed to row) planting, it’s very, very easy to miss lots of pods that will be hidden in the greenery, especially in toward the middle. Yea peas! - an entire web site about peas. Peas are members of that huge and wonderful family, the Fabaceae (till recently the Leguminosae), the legumes, which are as extraordinarily nutritous as they are extraordinarily delicious. Other members of the family are all the beans (from chickpeas to soy), peanuts—not true nuts—and their cousin the ground nut, carob, licorice, vetches, lentils, jicama, fenugreek (a spice), as well as many plants useful for things other than food—such as clover, alfalfa, indigo, laburnums, wisteria, and lupins (and there are lots more). Besides the garden pea, there is a type called the “field pea”, no longer much grown for human food use, though some do still raise it (the type Alaska, and several others like it, can be found in many seed catalogues) for use in split-pea soup. Peas, which originated in the area between western Asia and Eastern Europe, are an ancient crop, used for food since, literally, the Stone Age (dried pea seeds have been discovered among relics in stone-age lake villages in Switzerland that are over 6,000 years old). They have been under conscious cultivation for thousands of years, but till remarkably recently the only kind known was what we today call the “field pea”, valued more for its nutritive and storage qualities than its taste, and rarely if ever eaten fresh, being usually dried for later use in soups and stews (including the nursery-rhyme-famous “pease porridge”). The use of peas as a fresh vegetable apparently began about a thousand years ago, but eating quality improved only slowly. Shelling peas sweet enough for use as a desireable vegetable seem to have first emerged only as recently as the 16th century, the first such sweet shelling peas we hear of being Rouncival or Rowncivall Pease. But the real jump forward began from the efforts of an English breeder named Thomas Andrew Knight, who worked in Bedfordshire in the early 18th century. By a century later, good-quality “English peas” (another name for garden peas) numbered dozens of popular cultivars. The Anglo-Saxon name for the vegetable—plant and edible seed—was “pise”, apparently acquired from the Latin pisum; later, the word mutated to the more familiar “pease” that we still see in such terms as “pease porridge”. “Pease” was then a singular, and one spoke of planting pease as we today speak of planting corn—not “corns”. But the word was often mistaken by the ignorant for the plural of a imagined (but nonexistent) singular “pea”; over the centuries, that false singular form, from constant repetition, became the real form. You loaded this page on Friday, 19 April 2019, at 16:44 EDT. It was last modified on Friday, 1 February 2019, at 18:59 EST.